Let cookie dough stand at room temperature 10 minutes to soften. Meanwhile, heat oven to 325°F. Line 2 large cookie sheets with sides with nonstick foil or cooking parchment paper. In large bowl, mix cookie dough and cinnamon. Add oats, almonds, pecans, coconut, raisins and cranberries; knead into dough until well blended. Crumble mixture evenly on cookie sheets. Bake both cookie sheets at the same time 17 to 22 minutes, stirring every 5 minutes and rotating cookie sheets halfway through baking, until light golden brown. Cool completely on cookie sheets, about 30 minutes. 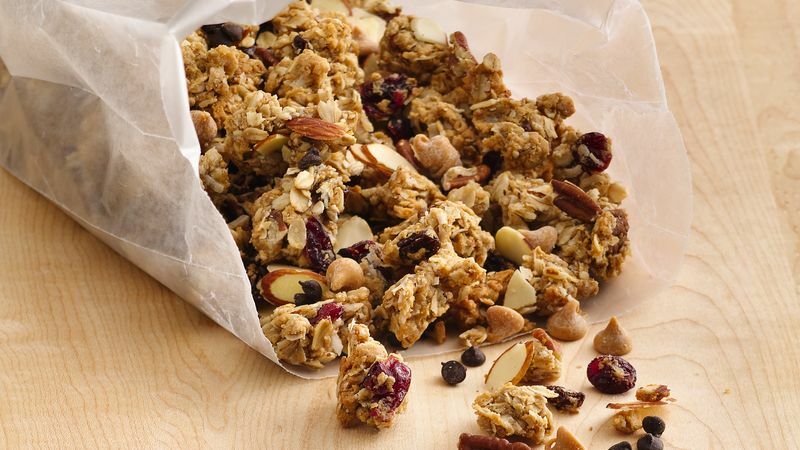 Break granola into smaller pieces if necessary. In large bowl, mix granola, chocolate chips and peanut butter chips. Store in large resealable food-storage plastic bag, or store in 1/2-cup amounts in small food-storage bags for ready-to-go snacks. Store up to 3 days.